For today’s Ruby Tuesday, I’ve got a little history lesson for you all, about a popular seafood restaurant in Orlando, Florida. 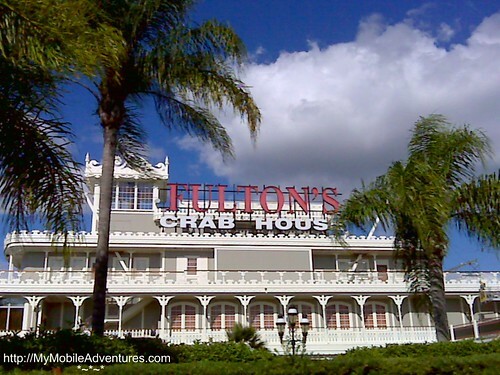 Located in Downtown Disney, Fulton’s Crab House opened in the mid-1970s and was originally called The Empress Lilly. Named after and christened by Walt Disney’s wife Lillian, this paddle-boat styled structure housed three different restaurants and a lounge. After many years, Disney began to outsource the management of their restaurants, and The Empress Lilly underwent a transformation into the Fulton’s Crab House restaurant you see there today. It’s been a few years since I’ve eaten there, but I seem to remember that I liked the crab cakes a lot! Have you eaten at Fulton’s Crab House recently? Was it good? Bad? Downright UGLY? Please leave a comment and share your experience – I’d love to hear about it! The showboat style is eye catching, but what about the food? I couldn’t say, not having eaten there. But I can guess that if fresh Atlantic and Gulf seafood is served (and I’m thinking Grouper, Shrimp, Snapper and Conch), it has to be good! We ate there a few years ago. It may look cool, have a menu that sounds great—-don’t be fooled. Having lived along the Gulf Coast for many years, I would have to say it was some of the most overpriced, poorly cooked seafood ever presented to the public. Red Lobster puts them to shame for about 1/2 the price. There are much better places to eat at Disney. We eat there practically everytime we go to Downtown Disney. We’ve had very good meals and some that weren’t so great but still ok. I love it when we get a window seat overlooking the water. the boat-shaped structure looks lovely. OMG, Tink! Thank you so much for posting this!!! I ate there back in 1978, but I never made the connection that it was the same boat! There were shops there, at that time, weren’t there? Was it called Lake Buena Vista something or other? I have such a hazy memory of it. It’s been some time since I’ve eaten there as well, but the food was wonderful and the service was first class. Great photo and thanks for the history lesson. Happy RT. It makes a great picture! Love the dramatic sky in the background too! Cool looking restaurant! The angle of the shot gives it drama. What I really want is a photo of a red crab. Now that would be great for Ruby Tuesday. Mo, I think it was actually called “Disney Village” when first built. There are still lots and lots of shops, both in the section called “The Marketplace” and in the section called “The West Side”. And yes, I do believe the name of the city is technically “Lake Buena Vista” – at least, that’s what the postal address for most of the Disney resorts says. Nope. Never been there. But I love seafood, so if it’s any good at all I’d probably like it. I have eaten there. It was really good. It is expensive, but look at where it is. Everything is expensive at Disney. Lovely shot of a loverly, loverly restaurant where I did eat a few times … long, long ago … when I was still young and attractive. Ha ha ha and ha, only joking. I ate there a few times, though, and that must have been in the late seventies/early eighties, when my daughter was still a youngster. Love the red sign, of course. Happy RT! Looks beautiful – and well maintained. Impressive looking building; thanks for sharing. Interesting building to be sure and if they have good crab cakes then count me in! I love ’em, but they’re awfully hard to find in Israel. Great photo and interesting story. I have not eaten there; but it does sound like a place I would like to visit. I would love to try their menu, but I never have been there. Based on the building’s appearance, it should be quite unique as well. Thanks for sharing some history :). Sounds good, and the paddleboat design adds some interesting atmosphere. I’ve never eaten there, but love the photo! Thanks for stopping by my place. Have a great day!! I do enjoy seeing Florida’s Disney World through your photos. I’ve not been there, but I have visited Disneyland in Anaheim numerous times. I worked on the Empress Lilly for about 3 years as a server and bartender. It was in the Lake Buena Vista Shopping Village. I have since worked in a number of restaurants as a server, bartender, and manager. (Ruth’s Chris, Outback, Bennigan’s) and others. The time I worked at Disney 1979-84 was the best I could ever hope for. The staff was exceptional; the best I have ever been with. The Baton Rouge Lounge hosted “The Riverboat Rascals” Dixieland Jazz Band and “Denny Zavett”, a solo guitar/comedy act. They performed on stage behind and above the U shaped bar. When I was there we were the highest volume sales lounge on Disney property. On the first floor with the lounge was a beef restaurant. On the second level was the seafood restaurant and the only gourmet restaurant at Disney, “The Empress Room”. The third floor was used for banquets. Never been there, looks like nice restuarant. Thank you! Hello Joe! (a year later!) I spent MANY nights on one of the barstools at the Baton Rouge with my friends. We loved the Riverboat Rascals (my friend had a crush on Dave the piano player) and Denny was always a great show….I miss the chicken song! Ken and Larry were our usual bartenders – great guys, and Ken had my drink in hand as soon as we walked in. Gotta love that. Those were great times and I have wonderful memories of the Baton Rouge Lounge. Thanks for bringing them back.